Minister of Mines and Steel Development, Dr Kayode Fayemi, has congratulated the candidate of the All Progressives Congress (APC) in the Edo State governorship election, Mr. Godwin Obaseki, for his victory, saying the Edo people opted for tangible development above empty promises. 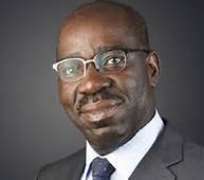 Obaseki was declared winner of the election by the Independent National Electoral Commission (INEC), having polled 319,483 votes to defeat the candidate of the PDP, Pastor Osagie Ize-Iyamu who polled 253,173 votes. Dr Fayemi, in a congratulatory message signed by his Special Assistant on Media, Mr. Yinka Oyebode, said the people of Edo State have demonstrated, through their votes, their preference for progressive leadership, good governance and all round development that characterised the eight years of the APC-led government in the state. Fayemi said he was convinced that Obaseki will build on the good foundation already laid by Governor Adams Oshiomhole, whose visionary leadership has impacted positively on the people of the state. “There is no doubt that the state would witness greater level of development, judging by Mr Obaseki’s pedigree as a strategic planner and seasoned administrator.” He added.